If you have picked up Samsung’s new flagship you will be familiar with the Galaxy S10 camera light ring. It lights up when facial recognition is actively detecting your face or when you switch from the rear to the front camera. It also lights up to work as a countdown timer for selfies. Samsung doesn’t allow the light to be used for anything else and you certainly can’t use it for notifications. However, there’s a third-party app that lets you use the camera light ring as a battery indicator. 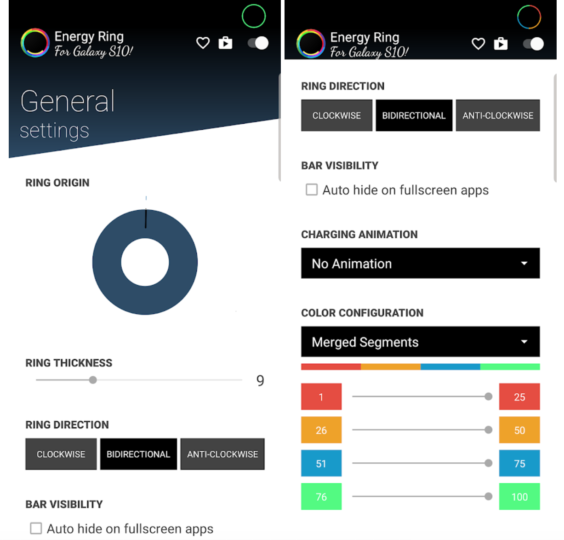 The app is called Energy Ring and it’s developed by IJP, As AndroidPolice notes, this developer has considerable experience with making custom battery indicators for Android. Energy Bar is one of its other creations and it supports the curved screens on Samsung’s flagships as well. Energy Ring offers you a variety of customization options such as ring direction, color, thickness and even different colors for each 25 percent increment. There’s also a toggle to disable the indicator on fullscreen apps so that it doesn’t get in the way when you’re watching videos or playing games. This app is currently optimized for the Galaxy S10 and the Galaxy 10e only. The developer is working to add support for the Galaxy S10+ as it has a larger, dual camera cutout. It’s available as a free download from the Google Play Store. The app does require notification access but that’s required for the battery indicator to function. Its own battery use is said to be negligible. There are some in-app purchases for additional functionality but the free version will be good enough for most users. One can only hope that Samsung allows the Galaxy S10 camera light ring to be used for other functionality. It would be particularly useful as a notification light. The company can enable that with a software update but there’s nothing to suggest at the moment that it will. Samsung will disable this feature like it was with illegal Bixby remapping. It does not work when screen is off. And when doing screenshot the whole hole appears on screenshot. What about AMOLED pixel burnout? Does this program have safety mechanism that moves ring to another piexels? You know, like how AoD elements moves from time to time.